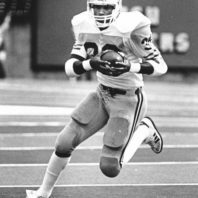 On a raw, wet fall afternoon in Eugene, Oregon, in late October 1984, Rueben Mayes’ feet carried him to what was at the time the greatest accomplishment of any NCAA running back. Just a week earlier, Mayes ran for 216 yards at Stanford in a rally that brought Washington State University from a 28-point third quarter deficit to a 49-42 win. Mayes on draw, up the middle, gain of 21; Mayes carries, gain of 20; Mayes up the middle, gain of 11; Mayes over right guard, gain of 27. 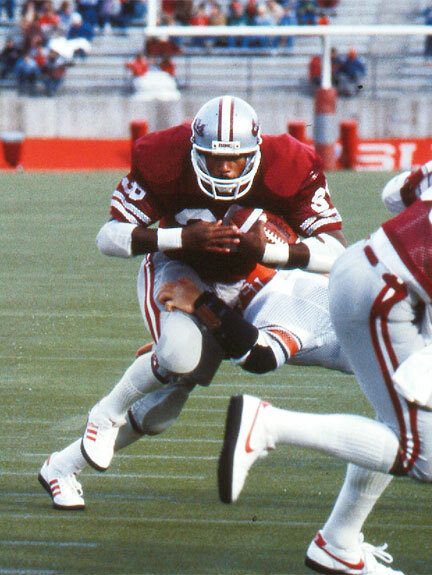 Rueben Mayes ’92, ’00 M.B.A, carries the ball in the historic 1984 game against Oregon. Photo Kevin Morris-U. Oregon. In leading WSU to a 50-41 win, Mayes ran for 357 yards–an NCAA-record–the majority of which came by way of the running play known as the draw. Mayes held the ball 39 times that rainy afternoon in Oregon. More than two decades later, he would hold another ball signifying the ultimate college football achievement: selection to the College Football Hall of Fame. Mayes had been on the ballot before, but those years ended without a selection. Then, earlier this year, a box arrived at his office on the Washington State University campus. 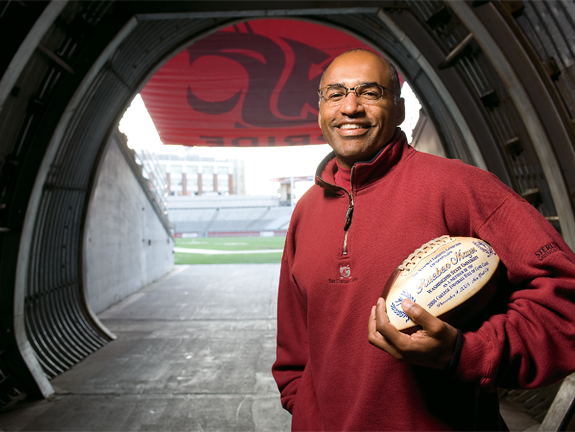 “I opened the box, and it had a football in it,” says Mayes, who at the time was the senior director of development for the WSU College of Business before moving on to become the regional director of development for Sacred Heart Medical Center in Eugene this past July. “On the football it said, Rueben Mayes 2008 College Hall of Fame.” Mayes recalls. “Then it had a letter congratulating me on my selection. It was an unbelievable experience. At first I didn’t really get the connection, but then I realized that’s what it was. Mayes wasn’t the only one relishing the experience. It was Mayes’ work-ethic that stays with Walden. 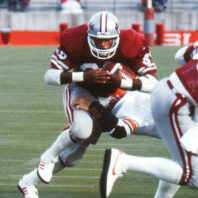 Mayes powers through a tackle in a game in Martin Stadium. Photo courtesy WSU Sports Information. Mayes joins a distinguished 15-member hall of fame class that includes Troy Aikman, Billy Cannon, Jim Dombrowski, Pat Fitzgerald, Wilber Marshall, Randall McDaniel, Don McPherson, Jay Novacek, Dave Parks, Ron Simmons, Thurman Thomas, and Arnold Tucker, and coaches John Cooper and Lou Holtz. Rypien, who went on to play in the NFL and was a Super Bowl MVP, echoes his former teammate’s sentiment. 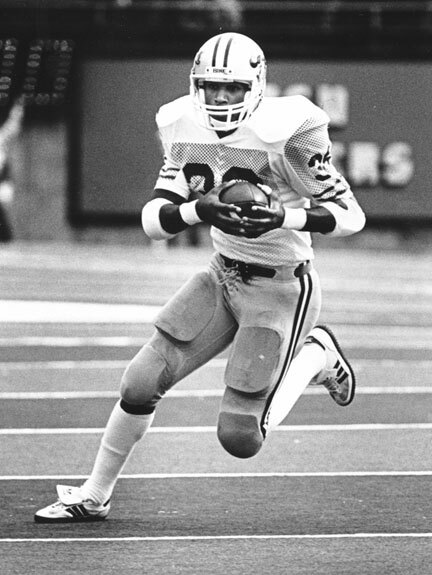 “For us bystanders on the outside it should have been done a lot sooner,” says Rypien, who along with Porter and Mayes made up the famed “RPM” Cougar backfield of the mid-’80s. “He lit up the room by being very accommodating to everyone. There wasn’t a guy on the team who didn’t like Rueben Mayes. He was just a fun guy to be around. “Not only was Rueben a great physical athlete, but, more importantly, it was what kind of a guy he really is, and I think that signifies a very well-deserved induction into the College Football Hall of Fame,” he adds. The 2008 College Football Hall of Fame class will be inducted at the National Football Foundation Annual Awards Dinner, December 9, 2008, at the Waldorf-Astoria in New York City. They will be officially enshrined at the hall in South Bend, Indiana, during ceremonies in the summer of 2009.